… change his schedule at the last minute to pay his respects at an important place of worship in Sri Lanka’s capital and to witness a key ritual for Buddhists: the opening of a casket containing relics of two important disciples of the Buddha. Usually, the relics are only put on display once a year, and Buddhists from aroundSri Lanka line up for days to pay homage to them since it is such a rare privilege. 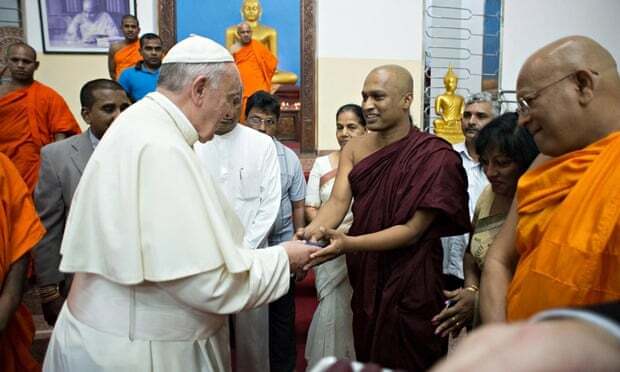 The head monk at the temple, Banagala Upatissa, said that allowing the pope to see the relics was “the highest honour and respect we can offer to his holiness”. This entry was posted in Commentary, News and Events and tagged Agrashravaka temple, buddhist relics, Pope Francis, Sri Lanka by Frank Kaufmann. Bookmark the permalink.